Most of my AdventureNotes talk about traveling to cities (except if you consider Hull not as a city, haha!). This time, I will share my experience traveling to villages. I think around February, I got a chance to visit Peak District. It is an area categorized as one of National Parks in the UK. It is located to the north of Birmingham, just beside Sheffield. If you love the greens and nature, you will sure love it here. It is not easy to reach this place. First of all, Peak District is big! There are various villages and green areas included in this district. Therefore, you have to be specific as in where you want to go to. 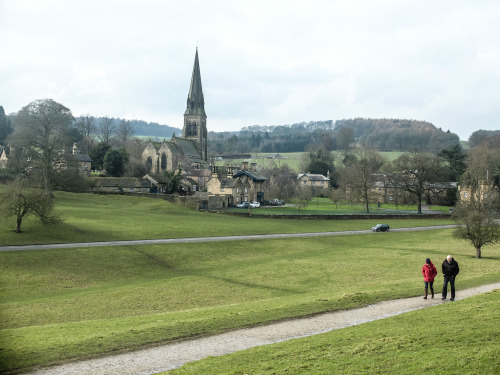 As an Indonesian, we (yes, I visited the place with some of my friends) are inspired by a novel written by Andrea Hirata that is titled Edensor. Indeed, Edensor is the name of a village in Peak District. We don’t know why he chose that title for the novel, but it is legendary. We decided to visit the village as our main destination and then explore the surrounding area later on. So how did we manage to get into the village? By car. There is access by public transportation, but the service is scarce. You have to go to Sheffield first, and then take a bus to somewhere near Edensor. It is even more scarce in the weekend. Actually, it was my first time experience renting a car to go somewhere in the UK. The process is not difficult and we can do it online. My husband just had to collect the car in the appointed place (usually airports) on the allocated time and to return the car also at the allocated time. We paid a little bit more for the insurance because it ‘safeguard’ us from further claims from the car rent company if something happen to the car. As a common policy here, we take the car with full tank of fuel and we have to return it in the same condition. So, don’t forget to calculate these costs when you are comparing the price of renting a car and of taking a public transportation. Oh! One more thing. We can use our Indonesian driving licence here as we have been living in the UK for less than a year. If you have lived in the UK for more than a year, you have to apply for the local driving licence. The journey from Birmingham to Edensor should take around 1.5-2 hours. We took longer time because we got a bit lost. The intersections in UK is just confusing! Haha. Starting our journey from Birmingham at 7, we finally arrived at Edensor at around 10. The journey was pleasant and the surroundings and ambience was really different when we start coming into the Peak District area. It was just green and beautiful. Finding a parking space is not too difficult there. There is one big parking area near the Cathsworth House, but we chose to park just along a street in the Edensor Village. Edensor Village is a very small area that consists of maybe around 20 houses. It has only one main street, a church, and a tea house. At the end of the main road, there is a huge green area for farming. We explored the village, came inside the greenery area and enjoyed the view. Having had enough of the village, we then walked across the road to a park. I think the name is Cathsworth Park. The view from the park onlooking the Edensor Village is even more beautiful. We seriously thought that it was the place where the inspiration for the book cover was. We endlessly took pictures there. Walking through the park, the scenery was amazing. At one end, we could see the Cathsworth House. It is the house for the Duke and Duchess of Devonshire. Nowadays, it is open for public, exhibiting numerous art collections. We can also visit the farm, garden, and annual Christmas event there. Unfortunately, at the time we visited the area, the house was closed for renovation. It was such a shame. I would love to see the inside of the house as the outside is so grand! After having a picnic near the house, we just drove around the Peak District area. There are many little villages and the so-called towns. The villages are not far from each other. Again, it is all about the beauty of a country-side. We drove to a high point in Buxton. Climbing up to the hills, we can see such a beautiful scenery. Along the way, we saw many cyclists. I think it is a popular area for outdoor activities, such as hiking, cycling, and motorbiking. What’s interesting is that with that contour (steep hills and slopes), the outdoor activities are really for everyone. I mean, we saw kids with their parents, and even senior citizens doing the same activity. Gosh! How strong are they! Anyway, the visit ended there. It was such a refreshing escape from the hustle bustle of a city. Peak District done, but I still have a long checklist to go. Maybe next, I will visit Lake District!